Filmmakers Lee Unkrich (L) and Darla K. Anderson, winners of the Best Animated Feature Film for 'Coco,' pose in the press room during the 90th Annual Academy Awards at Hollywood &amp; Highland Center on March 4, 2018 in Hollywood, California. "We began to feel a new urgency to get the film out in the world," said director Lee Unkrich. The filmmakers behind Coco, Sunday's Oscar winner for animated feature film, criticized Donald Trump in backstage comments without ever naming the president. Coco is the story of Miguel (voiced by Anthony Gonzalez), a young Mexican boy who pursues his dreams of becoming a musician despite his family’s mysterious objections to music of any kind. 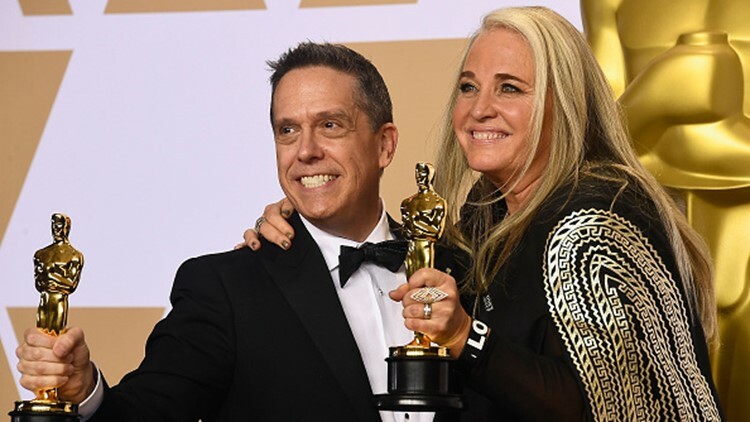 Presidential attitudes toward Mexico, celebrated in the hit animated film, changed dramatically during the long process of production, director Lee Unkrich told reporters in the Oscars press room. "We started making Coco six years ago. It was a very different political climate than we find ourselves in now. While we were making the film, we had a change of presidency and a lot of things started to be said about Mexicans and Mexican-Americans. That was unacceptable," he said, clearly referencing candidate Trump's comments, including one about Mexican immigrants being drug dealers and rapists. "We began to feel a new urgency to get the film out in the world, to get a positive message about the beauty of Mexico (and) the Mexican people and also give Mexican-American kids something to aspire to and to see a bit of themselves on the screen," he continued. "We knew how important it was and we tried to make the best film, the most respectful film we could. And it just means the world to us the film ended up being the biggest movie of all time in Mexico and that it’s done so well around the world," Unkrich said. "Its message about family and the importance of remembering loved ones and keeping their memories alive seemed to resonate with everyone around the world." Singers Miguel (R) and Natalia Lafourcade perform onstage during the 90th Annual Academy Awards at the Dolby Theatre at Hollywood & Highland Center on March 4, 2018 in Hollywood, California. Singers Miguel (L) and Natalia Lafourcade perform onstage during the 90th Annual Academy Awards at the Dolby Theatre at Hollywood & Highland Center on March 4, 2018 in Hollywood, California. (L-R) Sound mixers Gary A. Rizzo, Gregg Landaker and Mark Weingarten accept Best Sound Mixing for 'Dunkirk' onstage during the 90th Annual Academy Awards at the Dolby Theatre at Hollywood & Highland Center on March 4, 2018 in Hollywood, California. Sound designers Richard King (L) and Alex Gibson accept Best Sound Editing for 'Dunkirk' onstage during the 90th Annual Academy Awards at the Dolby Theatre at Hollywood & Highland Center on March 4, 2018 in Hollywood, California. Actor/singer Mary J. Blige performs onstage during the 90th Annual Academy Awards at the Dolby Theatre at Hollywood & Highland Center on March 4, 2018 in Hollywood, California. Costume designer Mark Bridges accepts Best Costume Design for 'Phantom Thread' onstage during the 90th Annual Academy Awards at the Dolby Theatre at Hollywood & Highland Center on March 4, 2018 in Hollywood, California. Actor Eva Marie Saint speaks onstage during the 90th Annual Academy Awards at the Dolby Theatre at Hollywood & Highland Center on March 4, 2018 in Hollywood, California. Actor Lakeith Stanfield speaks onstage during the 90th Annual Academy Awards at the Dolby Theatre at Hollywood & Highland Center on March 4, 2018 in Hollywood, California. Actor Sam Rockwell accepts Best Suppoorting Actor for 'Three Billboards Outside Ebbing, Missouri' onstage at the 90th Annual Academy Awards at the Dolby Theatre at Hollywood & Highland Center on March 4, 2018 in Hollywood, California.